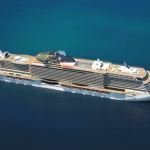 MSC Cruises will soon launch a new €700 million ship featuring an innovative design. Reminiscent in places of the curvy art deco buildings in Miami's South Beach, the ship will be intended for hot climates. MSC Seaside will be the first ship in the Seaside class, scheduled for delivery in November 2017. A second, MSC Seaview, is scheduled for delivery in May 2018. Italian shipbuilder Fincantieri will build the ships in its Monfalcone shipyard. 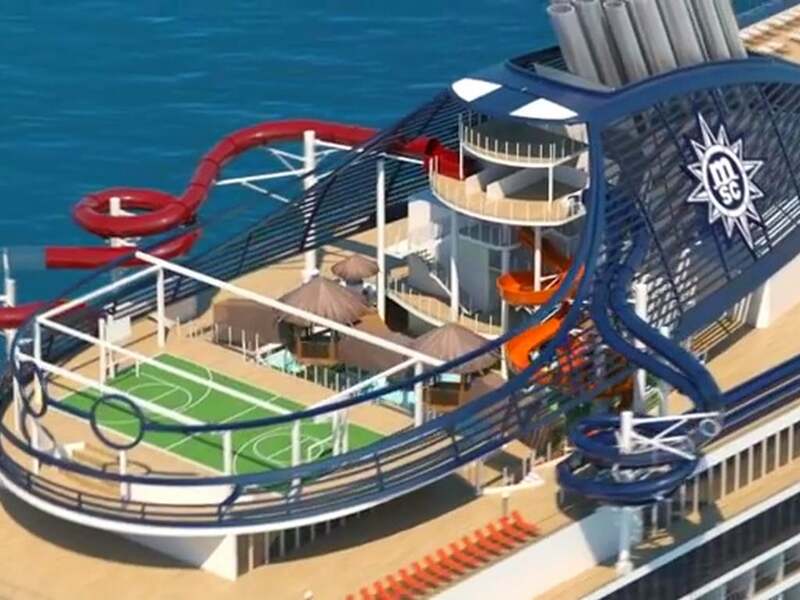 MSC Seaside will home-port in Miami all year around, offering a variety of Caribbean itineraries. The ship will call at MSC Cruises new private island, Ocean Cay MSC Marine Reserve. MSC Seaview will regularly sail a Western Mediterranean itinerary from June 2018. The christening of MSC Seaside will take place at a glitzy ceremony in Miami in December 2017. I would like to see the cruise line choose an American-Italian Godmother given the cruise line's Italian heritage and its commitment to the United States of America. The cruise line has many such celebrities to choose from, including names such as Selena Gomez, Kaley Cuoco (The Big Bang Theory), Jennifer Aniston (Friends), or even Lady Gaga (Stefani Germanotta). Their choice will likely be announced late in the year. This class of cruise ship will turn heads, thanks to its experiment architectural. Rather than follow traditional angular shapes, MSC Seaside is full of curves. No more is this clearer than at the aft, where the upper decks bend to form a unique shape, reminiscent of seaside apartments. The radical new design does take some time to appreciate, but it is a progressive step forward for the industry as a whole. I like that the lifeboats have been tucked out of sight from the open decks, potentially offering better views from some cabins. I am not sure how well a swimming pool so low down on the vessel will fare. Will the drone of engines whirring and propellers turning force passengers to the quieter pools on the upper deck? 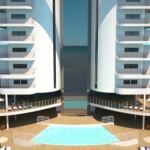 MSC Cruises promises many innovative features, some of which will also star on its other new cruise ship for 2017, MSC Meraviglia. A sea-level promenade that circumnavigates the ship with outdoor spaces, shops and restaurants will take advantage of the warm Caribbean sunshine. 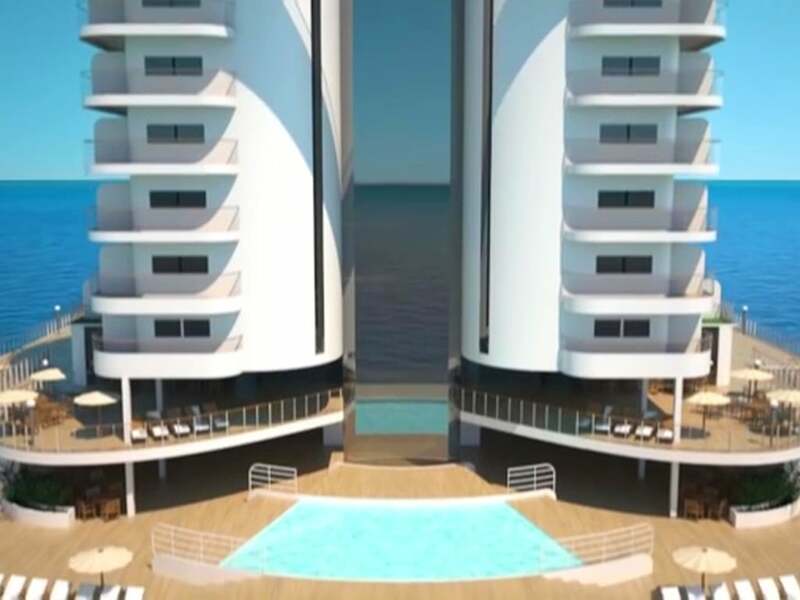 Panoramic lifts with sea views will sit inside the uniquely curved rear of the ship. A keen focus on energy efficiency should return a fuel consumption saving of up to 25% compared to traditional ships. Scrubbers will reduce harmful emissions. Expect energy-efficient LED lighting onboard. Behind the scenes, Advanced Water Treatment systems will remove pollutants and hazardous substances from waste water. Highly efficient garbage treatment plants will manage solid waste. Below the water line, antifouling paints, optimised hull lines, and streamlined propellers and rudders will help to reduce drag, saving fuel. 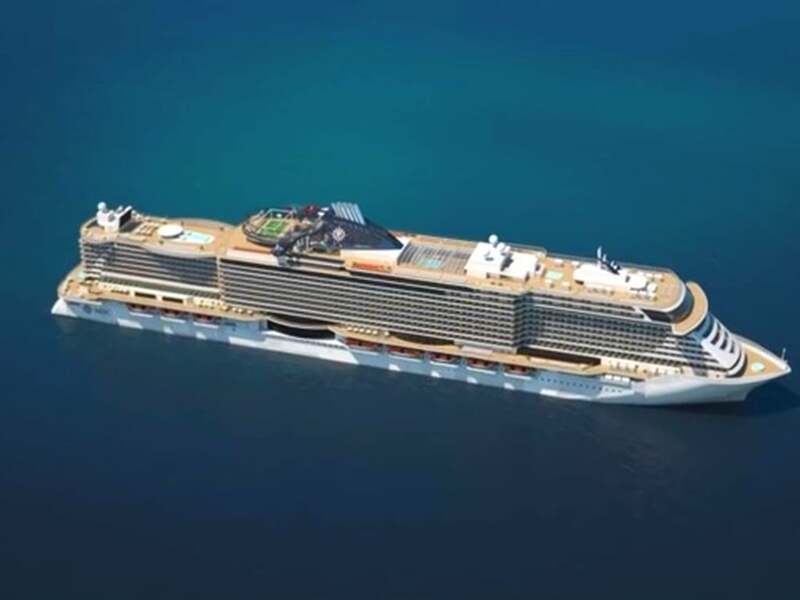 The 154,000 gross tonne MSC Seaside will measure 323 metres in length, 41 metres wide, and 70 metres tall. 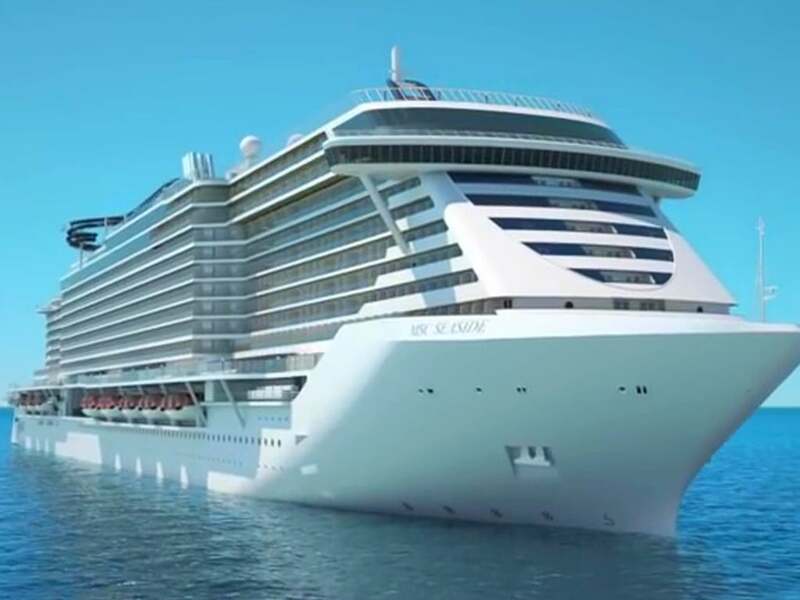 The vessel will have 2,070 guest cabins with a further 759 cabins for crew members, accommodating 4,140 passengers based on double occupancy plus 1,413 crew members. Families will love one of the most interactive aqua parks at sea. Award-winning designer and manufacturer of waterpark attractions, WhiteWater, is tasked with creating a fun and engaging space. AquaPlay and AquaSpray will feature tipping buckets, spray cannons, jets, waterfalls, a rain tree, a fort, and a mini-slide. 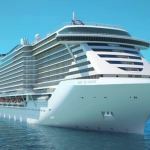 MSC Cruises will introduce the concept of 'slideboarding' to the cruise world. This unique ride is part waterslide and part video game. Guests will race down a two-storey, 112-metre long slide on a raft that contains an embedded game controller with coloured buttons. Match the colour of the flashing strobe lights seen on various sections of the slide with the coloured buttons on the raft. Slideboarding is what happens when Guitar Hero meets a water slide! The slide will be equipped with intelligent technology so it will know who the riders are and it will tracks their progress, scoring the run down the water slide. 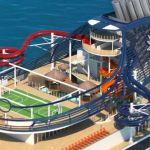 A pair of Duelling High-Speed Aquatubes will pit guests against each other, riding on single or double inner tubes through metres of twists, turns, and drops that partially extend over the side of the ship. Warm Caribbean sunshine is perfect for the Adventure Trail Ropes Course. This ropes course will allow participants to criss-cross between towers, rope bridges, climbs, crawl-throughs, and slides. You should also enjoy a bird’s eye view of the water. Inside, MSC Cruises' staples include a bowling alley and a Formula One racing car simulator. Do you like the curved lines of MSC Seaside? Let me know your thoughts on the ship's design in the comments below.